Looking for the final spot in the 2018 BB&T Atlanta Open singles qualifying draw, four survivors from an earlier knockout draw took to the courts of Life Time Athletic and Tennis in Peachtree Corners, for semifinal play on Wednesday. 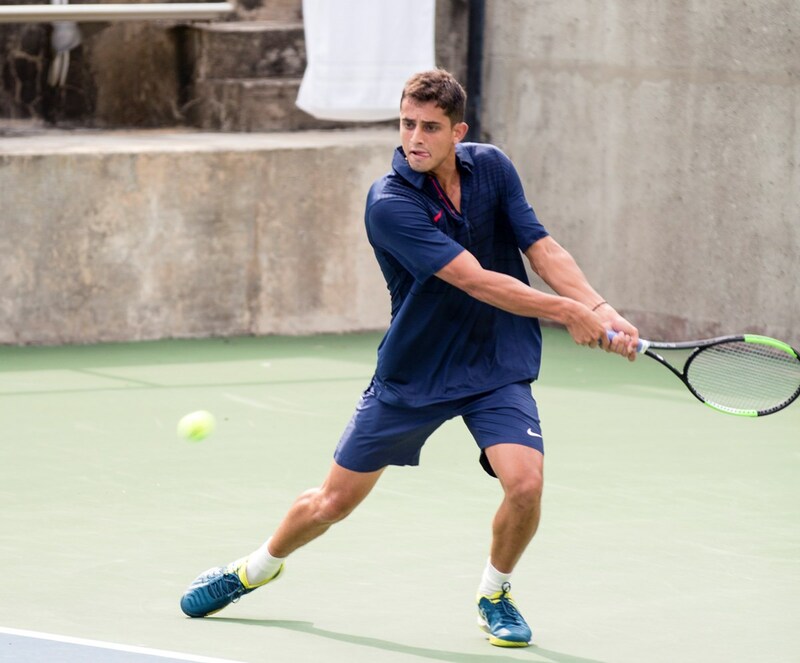 In the first semi, Kiranpal Pannu, a player at Columbus State, who has been testing the waters of professional tennis by playing some ITF Futures events, took on Michael Kay, who just finished his collegiate career, playing for Georgia Tech. The players took to the court on a hot morning, but the early play may have been even hotter. Each player held serve until 4-4, when Pannu found some rhythm in his return game to break after a two long rallies. That was followed by an easy hold to take the opening set, 6-4. The second set began with a service break with Pannu keeping relying on his same tactics, to take a 1-0 lead. Kay then seemed to gain some confidence and momentum to break back for 1-1. Kay led 5-4, and a long game featuring numerous break opportunities took place, but Pannu ultimately held to tie it back up at 5-5. The set reached 6-6, and again the tennis was high quality and the points were long, before Pannu raised his arms in victory, 6-4, 7-6(6). Pannu will take on Ralf Steinbach on Thursday as Steinbach defeated William Grattan-Smith, 6-4, 6-1. Steinbach is a former Ohio State player and Grattan-Smith will be starting his second year at Nebraska. The first set featured a back-to-back service breaks to start off the match and long rallies. Steinbach appeared to wear down Grattan-Smith to break at 4-3 and then closed out the first set on his serve. Grattan-Smith started the second set off strong by holding his own serve and getting up 1-0, but Steinbach's experience showed by breaking and then holding and breaking again to go up 4-1 in a matter of minutes. Steinbach again showed he might be the class of this field, winning the match 6-4, 6-1. The current schedule has the finals slated for 10 a.m. on Thursday, July 19, back at Life Time Athletic and Fitness in Peachtree Corners, and at 2:30 p.m. indoors at Life Time if it rains.